Home / MOVIE REVIEWS / "Don't Breathe" Movie Review: Catch Your Breath To This Immersive Horror Film! "Don't Breathe" Movie Review: Catch Your Breath To This Immersive Horror Film! Columbia Pictures' latest suspense-thriller tackles about home invasion, robbery, abduction, violence, and a whole lot of scary things that will make you literally catch your breath as you watch the movie "Don't Breathe". When we saw "Don't Breathe" in a special screening preview a few weeks ago, we felt stressed and gasping for air but we were entertained and scared at the same time. The movie is from the producers and studio that brought you the scary as hell film and equally stressful movie "Drag Me To Hell" headed by Sam Raimi (also "Spiderman" trilogy). "Don't Breathe" is directed by 2013's horror film, "Evil Dead" Fede Alverez. It stars Jane Levy (“Evil Dead” 2013), Dylan Minnette (“Goosebumps”), Daniel Zovatto (“It Follows”) and Stephen Lang (“Avatar”). 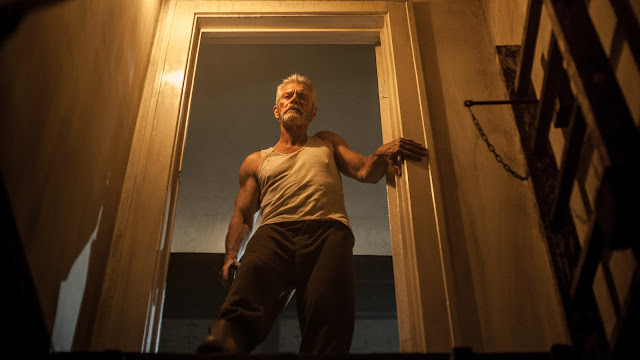 "Don't Breathe's" theme is really simply but the truth behind the situation in the movie is what scares the people out of their seats and literally catch their breath and gasp for air. There are some points in the story that the movie is becoming stressful to watch yet you will continue to watch it because of its entertainment value. The movie will terrify you up to the nerves and bones, and shock you where you need it the most and at the right moment! It's immersive plot is what makes it a powerful suspense/horror/thriller film that does not involve any paranormal activity such as a revengeful ghost, supernatural beings, or an out-of-this-world entity for an antagonist but only a blind ex-military man with a lot of money hidden inside his house. The money involved is what the home invaders is after to start a new life rather than that of stealing gadgets from others and selling them in an underground seller. Overall, "Don't Breathe" did not just give us the chills and thrills but also give us the entertainment value that we need to have while watching a horror/thriller/suspense movie like it should be. A 9 out of 10 stars movie experience. "Don't Breathe" is showing on August 31, 2016. If you want to be scared, watch it this week! Brought to us by Columbia Pictures International. Watch "Don't Breathe" full movie trailer below. Enjoy!